Following the exciting conclusion of the DCI Eastern classic this past August, Drum Corps International will return in a rare fall appearance at the venerable J. Birney Crum Stadium for the 14th Annual Collegiate Marching Band Festival this Sunday, Oct. 4 in Allentown, Pa. Presented by Vivace Productions, the exhibition event will feature the performances of 21 college marching ensembles beginning at 12 p.m. ET. $15 general admission tickets will be available at the stadium on the day of the event ($13 for students/seniors). When you're there, march on over to the Drum Corps International tent to chat it up with DCI representatives and other drum corps fanatics. Share your thoughts on the conclusion of the 2009 summer season and join our "Super Fan" mailing list for your chance to win a limited number of incredible prizes. Also be on the lookout for the hometown Cadets as well as the Jersey Surf who will be out and about this weekend. DCI college students: Tell us how you're preparing for the upcoming audition season and leave your advice for prospective corps members who are looking to make their debut with Marching Music's Major League in 2010. Before you leave strike a pose and have your picture taken for our Collegiate Marching Band Festival photo gallery that we'll post on DCI.org following the event! Even though it'll be summer again before Drum Corps International's World Class corps roll through Allentown, you'll have the opportunity on Sunday to order your tickets to the DCI Eastern Classic more than a week BEFORE they go on sale to the general public! The two-night packages start at just $30, giving you access to both exciting nights of competition. See you at the stadium on Sunday. Don't be a stranger! View a complete schedule of performing groups and more at VivaceProductions.com. 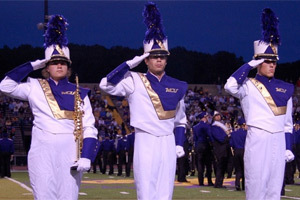 Photo courtesy wcumb.org.